Led by Ananya Chatterjea and Felicia Perry with Ananya Dance Theatre artists, this workshop explores our historic connections. The primary metaphor for this workshop is indigo, which was widely used in the global South historically, and currently. Did we meet before? Did our women ancestors meet? How did they stand with each other? How do we stand with each other? 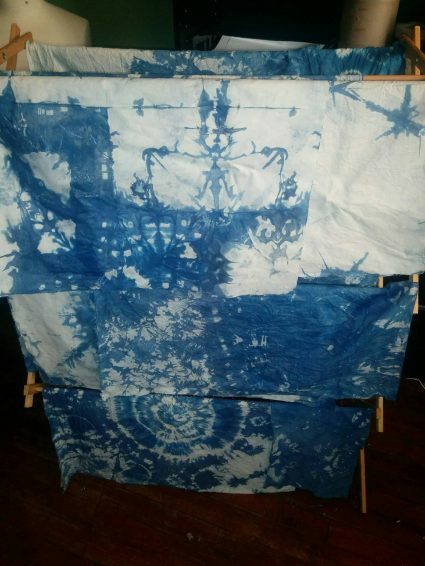 The indigo-dyeing techniques we will learn and practice will be used to spark movement and text in order to explore our connections. The workshop will be held in the Visual Arts Building, 2d Floor, on the campus of St. Catherine University, 2004 Randolph Avenue, St. Paul, MN 55105. Participation is free, please arrive on time. We will provide materials based on RSVPs: admin@ananyadancetheatre.org. We request that you come on time and be ready to participate in your own way. No dance training is required for participation and all dyeing materials are organic, not chemically-based.